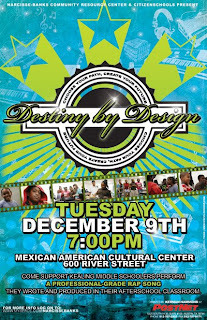 From the rockin' wedding speeches department... Destiny By Design @ Mexican American Cultural Center on December 9th! Who we are: Founded by Robert Gabriel and Jules Narcisse in 2006, the Narcisse-Banks Community Resource Center is a 501(c) non-profit foundation that serves the greater Austin, Texas area. Working closely with like-minded organizations including Guerilla Productions, Kinetic Global, River City Youth Foundation, and B-Boy City, Narcisse-Banks is a growing collective of hip-hop philanthropists. What we do: The Narcisse-Banks Community Resource Center aims to provide young adults with the tools to satisfy their educational and career interests in hip-hop culture. What we are doing now: The Narcisse-Banks Library offers a wide assortment of books and records to young adults and artists eager to explore the music, the history, and the career opportunities that correspond with the continued evolution of the hip-hop artform. To arrange to check out materials from the Narcisse-Banks Library, please send a message of interest through myspace. What we plan to do in the near future: Beyond hosting neighborhood book and record fairs, the Narcisse-Banks Community Resource Center plans to develop after-school programs for teens that will serve as instructional clinics on deejaying, hip-hop dance, spoken word, film-making, music journalism, etc. What we plan to do after that: Once the Narcisse-Banks Community Resource Center gains the footing to secure its own public space, the Narcisse-Banks Library will be augmented with a professional-grade production studio that will be made available to young adults motivated to learn how to record their music by way of a multi-track mixing board. What do we mean by hip-hop culture: From the blues and jazz to soul, funk, rock, Latin, reggae, and electronica, the Narcisse-Banks music-related curriculum attempts to encompass the full expanse of contemporary influence. What can you do to help: If you have any spare books and/or records that you think would make a relevant addition to the Narcisse-Banks Library, please arrange to make a donation by sending a message through myspace. Who we’d like to thank for their most generous contributions: DJ Baby G, Ruben Cantu, On the Line Records, Lady Legacy, Friends of Sound, DJ Avatar, Sween, and DJ Enki. Artists who have utilized our resources: Salih Williams, DJ Baby G, Tee Double, Public Offenders, 2-3 Mic Breakaz, Pilarsito, Lady Legacy, Global, Da Bosnian, and Black Mike.